Publisher Activision has filed suit against Brütal Legend developer Double Fine Productions to prevent the release of the heavy metal game starring Jack Black, putting the title's Rocktober release in jeopardy. According to a report from the Associated Press, Activision claims that Double Fine failed to deliver Brütal Legend on time and mostly on its dime. 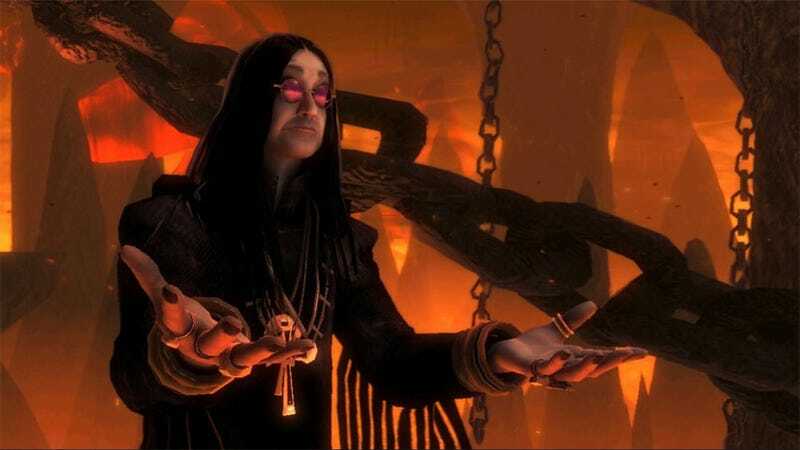 The suit contends that the Brütal Legend dev was paid $15 million to finish the game, but missed a key deadline, with Double Fine asking for another $7 million in development monies and a nine month extension. When Vivendi and Activision merged last year, Brütal Legend was missing from the list of titles that Activision would inherit and publish. But Activision claims it still retains its rights to the open world action adventure and that the mega-publisher has suffered "irreparable harm" in losing the game. The lawsuit is unlikely a surprise for EA and Double Fine, as Activision expressed its unhappiness with the game being handed over to its biggest competitor earlier this year. EA's response to Activision's legal threats called them as ridiculous as "a husband abandoning his family and then suing after his wife meets a better looking guy." Brütal Legend's presence at E3 2009 is big. New publisher Electronic Arts is banking heavily on the game, but if Activision is successful in its latest round of litigation, it's possible that we might have to start looking forward to a Rockvember or Rockcember release.